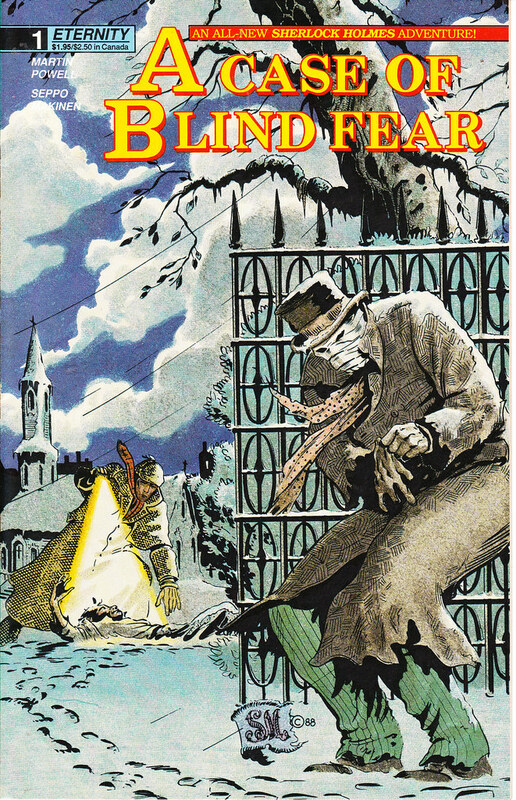 In 1989, Eternity Comics released a four issue Sherlock Holmes mini-series called a A Case of Blind Fear. 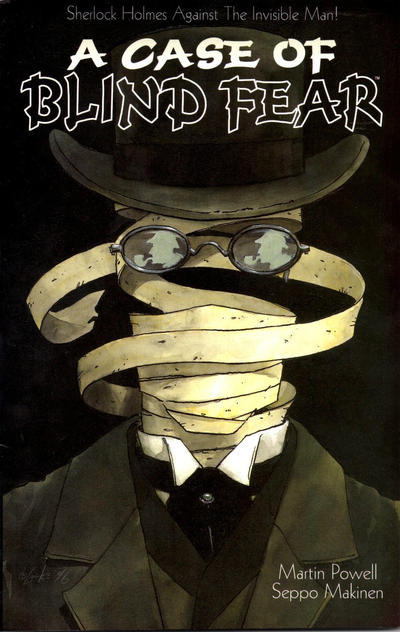 The comic was written by Martin Powell and drawn by Seppo Makinen. I actually bought this off the rack in 1989 mostly because I was and still am a big Sherlock Holmes fan. It has sat unread in my collection since then. 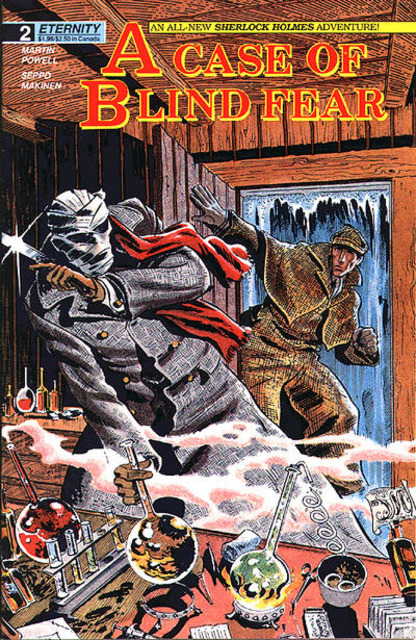 I don’t think I even realized until fairly recently while doing invisible man research for AWESOME-tober-fest that this comic was a Holmes vs invisible man story. But when I saw the cover online, I remembered that I had it in my collection and went to dig it up. Now I’ve finally read it. Twenty-six years later (!). I thought the premise would be Sherlock Holmes solving a mystery involving an invisible man. But it turned out to be a little different and a bit more complex than that. I expected something along the lines of Batman Unseen where Sherlock Holmes was solving the mystery of some murders by a man that had somehow discovered invisibility. What is actually going on here is more of a retelling of the HG Wells novel, but inserting Sherlock Holmes and Watson into the story. But it’s even more than that. 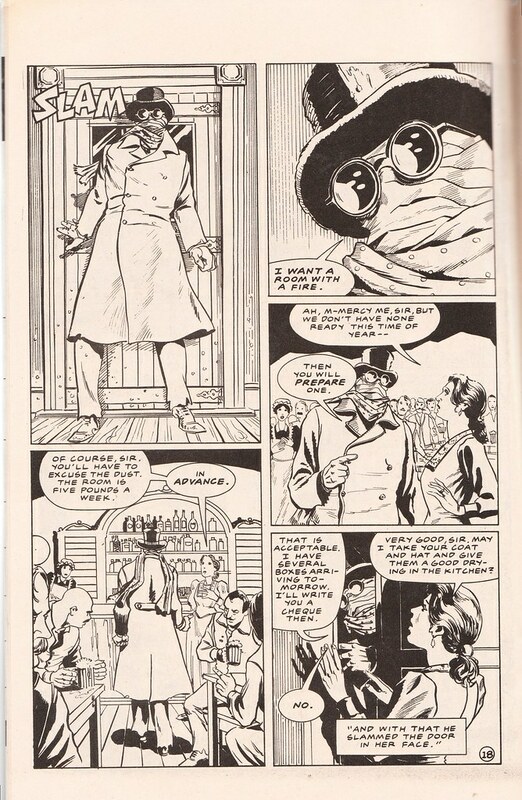 Within the story the main invisible man character is Griffin, the main character from the original HG Wells novel. However, he has a history with Watson. Griffin knows Watson from their time in the military together. Griffin apparently saved his life. This connection causes a change to the story in that when Griffin is in trouble, he calls on Watson and calls in the favor to hide from the authorities. All of this causes deviations from the original HG Wells novel, as it should. It’s really interesting how Powell takes the events in Wells novel and changes them to accommodate for the appearance of Watson and Holmes who are brought in almost organically and don’t feel “shoe horned” in just to get a story out of it. This comic is actually a pretty good read especially if you have already read the Wells novel. And even with the deviations, there are still some very familiar touchstones within the comic. Griffin still goes to the Coach and Horses Inn to find rooms. And he’s eventually kicked out for non-payment. There’s an invisible cat at one point which in the novel Griffin was experimenting on a cat with the invisibility serum. So even though Powell changed many of the events in the novel, he keeps many of the same events and places in this new story. But maybe used in a different way. I like that. 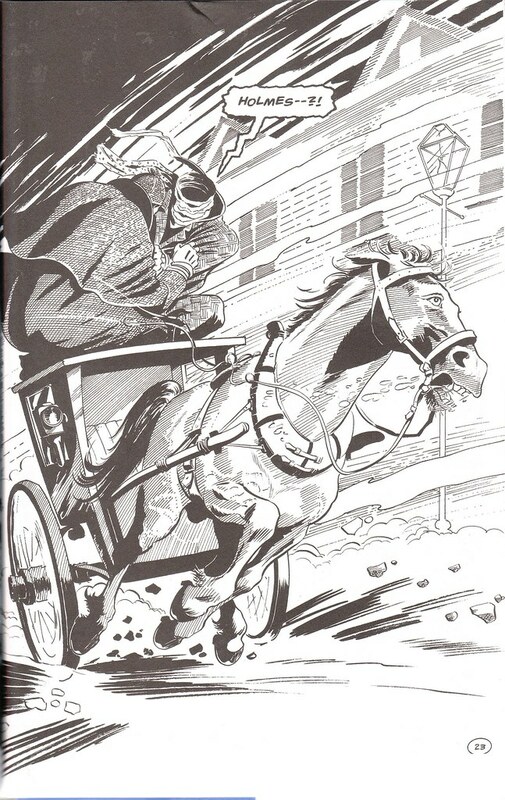 Also, Seppo Makinen’s art is really good. I’m not a huge fan of black and white comics. When I read Eastman and Laird’s original 80s Teenage Mutant Turtles comics from Mirage I read the newly colorized versions from IDW. But these pages were nicely rendered and looked great. Overall, it’s a nicely packaged, well written Sherlock story that uses the framework of HG Wells’ Invisible Man novel very well. However, I do have a fear that if you haven’t read the original novel, then you may miss a lot of this subtext and in that case I’m not sure how this story will come over. The story’s strengths could quickly turn into its greatest weakness. This entry was posted on October 8, 2015 at 7:00 am and is filed under comic books, Halloween, holiday, pop culture with tags AWESOME-tober-fest, AWESOME-tober-fest 2015, Halloween, holiday, Invisible Man, monsters, Sherlock Holmes. You can follow any responses to this entry through the RSS 2.0 feed. You can skip to the end and leave a response. Pinging is currently not allowed. Never heard of this series but sounds like a lot of fun.